On most every occasion when I’m speaking in public – at conferences, workshops, and the like – I tend to mention one or more of my “Giants” of Rightshifting. Men and women who, through their lives and work have contributed significantly to my understanding of work, and in particular to my understanding of effective collaborative knowledge work. Many folks express interest in these Giants, but I do wonder if they appreciate the relevance of the ideas and experiences of these Giants to their own daily lives at work. I mean, what relevance does, say, O Sensei have to developers, testers, operations staff and the like? Which aspects of any of these Giants’ work could be useful or helpful or simply comforting to these folks? In this occasional series of posts I’ll be exploring some of the Giants’ relevance to folks other than theorists, managers, consultants and the like. I’ll be sharing some insights into their work, and specifically, the likely relevance. With these posts I hope to pique your curiosity just a little. Let’s continue, with this second post in the series, with O Sensei. I’m not going to dwell on his early life and experiences in the Japanese Army, his adventures in Mongolia, nor his experiences in Manchuria and Japan during the time of World War 2. I suggest the primary relevance of O Sensei to most folks working in the field of software development (and production operations) is Aikido – the martial art he developed. Excepting it’s less a martial art, and more a philosophy for life, and for harmonising with others. Unlike many other martial arts, Aikido is focussed on caring for others, as emphasised by the translation of the three kanji: ai-ki-do as the Way of Unifying Spirit or the Way of Spiritual Harmony. 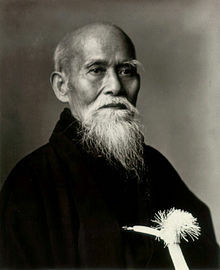 O Sensei envisioned Aikido as an expression of his personal philosophy of universal peace and reconciliation. O Sensei’s goal was to create an art that practitioners could use to defend themselves while also protecting their attacker from injury. “Blending“, one of the core techniques of Aikido, invites us to look at conflicts from the perspectives of the other person – or people – involved. For me, this has a direct connection with empathy – as promoted by e.g. Marshall Rosenberg and others of the nonviolent community. How do we make it more likely that we’re all spending our time on stuff that matters? How do we go about attending to folks’ real needs? I find blending a great asset in identifying with the needs of others. As I blend, I see their perspective, and their needs, more clearly. And in turn, they can feel more listened-to. And choose to reveal other things, crucial things, that means we get to understand more about what matters to us all. With this knowledge – and goodwill – we have a better chance of focusing on what matters, and of reducing the chance of wasting some or all of our time on the inconsequential, on detours, and on dead ends. You might like to join an Aikido dojo, to practice the physical forms of the techniques. And to discuss the philosophy with like-minded people wha have already started the journey. Beware, though, of those dojos and sensei that emphasise the physical forms at the expense of Aikido philosophy. Indicating a scene or view of something, esp. a pictorial representation: seascape, cityscape, soundscape. Word Origin: Abstracted from “landscape”. The financial needs of the owners and shareholders, and of staff. The particular needs of customers, which the business’s products and services attempt to address. The needs of suppliers for revenues. The needs of wider society for commerce, prosperity, growth of social cohesion and living standards, wealth distribution, and so on. The emotional needs of owners, shareholders, executives, managers and staff (examples: status, self-worth, compassion for others, making a difference, safety, love, esteem, curiosity, joy, learning, accomplishment, contributing to society, etc.). I use the term “needsscape” to refer to the ever-changing set of Folks That Matter, and their ever-changing sets of needs. (Not all the needs listed above might feature in a given business’s needsscape). In particular, the term Needsscape, for me, evokes the idea of one or more visualisations of the ever-changing set of Folks That Matter, and their ever-changing sets of needs, including the evolution of those sets over time. And especially visualisations of the current and relevant future set of Folks That Matter, their various sets of current and relevant future needs, and where the business is “at” in terms of attending to those folks and their needs. In other words, making all work (and objectives) visible, including attributes such as progress, status, and other interesting aspects of the work (aspects made interesting due, themselves, to the pertinent set of Folks that Matter, and their needs). Indeed, all value-adding work is attending to (some) folks’ needs. And all wasted work is work where folks’ need are undermined. What value would a real-time (or near real-time) visualisation of the needsscape bring to your group and/or business? Hiring an expert is a pretty much everyday occurrence. There’s accountants and lawyers, bankers and insurers, butchers and burger flippers, gardeners and mechanics. Sometimes we hire people not for their expertise, but simply to save us time, for example dog walkers or housekeepers. For those folks we hire for their expertise, what does that actually mean? In the Antimatter frame, we might choose to say that experts possess – and can apply – more effective strategies for getting (some of) our needs met than we possess ourselves. We’d not often tell our accountant how to calculate our tax liabilities. Nor our lawyer how to prepare and present our legal case. That’s because, with their more effective strategies, they’re likely to achieve a more effective outcome than we, with our relatively ineffective strategies, could. So we’re more likely to see our needs (in the round) get met. Well, let’s turn our attention to hiring people – be that employees, contractors or consultants. Sometimes we’ll hire people to save us time. We could do the job that we’re hiring them to do, but we have more valuable things we can be spending our time on, so we hire them to do the less valuable things. But sometimes, we’ll hire folks for their expertise. There’s some needs for which we accept our own strategies for getting those needs met are relatively ineffective. Like, running a software team or department, for example. So we find someone who appears to possess – and can apply – relatively more effective strategies. So far, so good. If we choose our experts well, we’ll see our needs met more effectively – sometimes very much more effectively – than if we chose to attempt to meet those needs ourselves. However. What happens when the effective strategies employed by our experts seem inexplicable to us? When we just can’t understand how applying their preferred strategies can achieve getting our needs met? We rarely quiz our accountants and bankers on their strategies. But we do quiz our new hires. As if we’d understand. We have crashed headlong into the “credibility barrier”. Where it’s our own incredulity that blocks us from hiring those very folks possessing the most effective strategies for getting our needs met. And the most likely outcome being, we’ll reject the expert and their expertise, rather than recalibrate our assumptions and beliefs about what’s credible. Maybe the client doesn’t like for anything to happen (therefore it’s not truly a Clean question). In the Antimatter frame, it matters little what the client might like (or want) to have happen. It matters a whole lot more what they might need to have happen. So, I generally open with “What might you need to have happen…” (the Antimatter frame). As I make no pretence to use Clean Language (excepting on the rare occasion), reason 1, above, is rendered moot. And reason 2 dissolves as we expressly ask what the client might need. I’ll just point out that this is a much harder question to answer, not least because folks may be able to quickly state what they’d like, but generally have much more difficulty identifying their needs. For me, this is another point in favour of the Antimatter frame – we can directly begin to explore the question of what they might need to have happen. And for this, I generally opt for the NVC (nonviolent communication) four step approach.